It's goose egg laying season! This year will be the third year for the mother goose and the second year for the kids. For laying eggs, that is. Last year we had more eggs than we could consume, and we gave away most of them. We are not going to let the eggs hatch, you know why! Inbreeding! 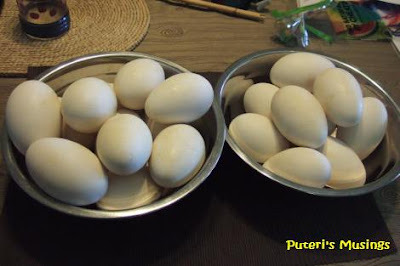 Just to show you the size of the goose eggs compared to the chicken eggs. Want to know exactly how big they are? Doug suggested I take a picture of the eggs next to a measuring tape! We've given away some of the eggs to our kids' teachers, and also to Doug's colleagues. 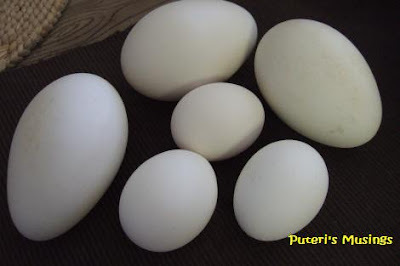 Goose eggs are rich - the egg yolk is thick and dark orange. Not everyone likes them. I made banana bread recently and instead of using two chicken eggs, I used one goose egg. Yummy! Too bad you guys do not live around here. Otherwise, you'll get to enjoy some of our goose eggs too! Sama asai teluk manok. Mina gamal aja lain .. teluk kuning iya besai and pekat. Nyu orange color iya, laban makai rumput ba luar. My neighbor has geese (lots of geese!) and we are finding eggs left and right around here. This morning, I found one ... and this afternoon, I discovered that she had 3 buried. My neighbor said that he doesn't want anymore geese (lol) .... and these darn things are fighting like crazy! If you touch the eggs, will the mother come back to the nest? 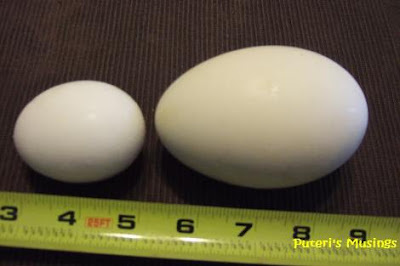 It will look small if you put it beside an ostrich's egg. Zawi, I have never seen an ostrich's egg! I'm sure it's a lot bigger than a goose egg!